Here’s to you, SPC Dennis Weichel – may we all be so lucky to be so mad! Words borrowed from our blog pal, El Snarkistani who had no snark today. In his blog, It’s Always Sunny in Kabul Finding the silver(ish) lining in Afghanistan’s Emerald City, he writes about SPC Dennis Weichel, who died saving a young Afghan girl in Laghman on March 22. SPC Weichel, a 29 year old member of the Rhode Island National Guard deployed in Iraq as a member of 3/172 Det 2 Mountain Infantry seven years ago. He reportedly arrived in Afghanistan only a few weeks ago as a member of C Company, 1st Battalion, 143 Infantry. 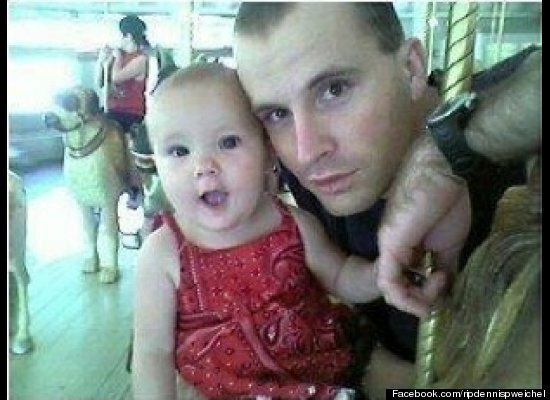 He was engaged to be married, and leaves behind his parents, fiancée and three young children. How come we don’t spend more time trying to figure out what went right? How come we don’t try to figure out how to make more Weichels instead of how to prevent the Bales? I’m not masochistic enough to do any in-depth research into how many hours of television have been devoted to SSG Bales. I do know that Good Morning America has already spent quite a bit of airtime on the Bales’ case, from his financial past, to his injuries, to more unfounded speculation about his mental health. Over several days. As if this sort of selfless act is somehow…unusual. That Weichel in a moment suffered a mental break that caused him to do something he and his comrades would never usually do. If you do nothing else, remember Weichel. Forget Bales. There is good in us, America. Even here, what can often be a place where hope dies, crushed by the weight of a thousand good intentions, good can be done. Not long-term. Not sustainable, maybe, but…good. I’ve come to the conclusion that “sustainable” is a buzzword created by those who’ve never had to watch someone bleed to death because they had the audacity to get a job with the only game in town. Since that job’s us, and people want us to go away…folks…get…dead. I myself have used it. I think it has value, I do, but at the end of the day? It’s making sure a little girl gets to go home at least one more day. So, SPC Weichel, here’s to you: insanely courageous bit of all that’s good in the world. I hope your brothers in arms make sure your children know this. Know that their dad, no matter what else may be true about him, cared enough about someone he didn’t know to pay that ultimate price. Someone who, maybe, for a moment, reminded him of one of his own. Wherever you are, rest easy, soldier. You did good. May we all be so lucky to be so mad. When El Snarkistani doesn’t make me laugh until I cry about Afghanistan, he makes me think and cry until my head hurts. But I still read him everyday. I hope that is true. Rest in peace, SPC Dennis Weichel.